The Center for Well-Being offers a quiet place to relax, with 7 stations for self-exploration and self-renewal. No appointment needed!
. . . all of which will contribute to your ability to be a successful student and to make positive decisions about your future. 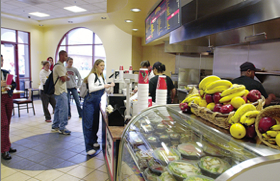 Free nutrition counseling is available to all SDSU students. Nutrition counselors can consult in areas such as weight loss and management, weight gain, vegetarian diets and other general nutrition needs. Learn to assess your level of wellness and emotional well-being by examining your level of stress and anxiety, depression, use of alcohol, and eating habits, and more. Learn about personal wellness topics and opportunities including personal growth workshops, counseling, nutrition and exercise, alcohol and drug issues, sexual health, peer health education and more. The Division of Student Affairs Division promotes the individual development and welfare of all students so that each student can thrive. 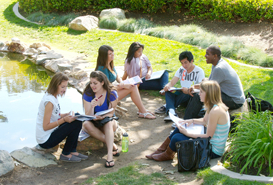 Learn more about how Student Affairs promotes health and wellness for all SDSU students.